Our old friend denierbud, of "One-third of the Holocaust" fame, seems to have a particular sympathy for SS-Oberscharführer Karl Frenzel, one of the members of the SS-staff of Sobibor extermination camp. This project is dedicated to Karl Frenzel (sentenced to life in prison in part due to Blatt's testimony against him) to Frenzel's 5 children who had their dad taken away to prison, and to his wife, who died from complications from being raped by a Soviet soldier. The Germans who worked in delousing camps framed as death camps, like Sobibor and Treblinka; or who worked in labor camps framed as death camps like Auschwitz. They were vulnerable to prosecution. Any German who worked in these camps, could have a Thomas Blatt figure come along and say "I saw you beat my father!" on the witness stand. Thomas Blatt's testimony, for instance, was largely responsible for putting Karl Frenzel in jail for his whole life. So, was that what happened at the trial against former members of the Sobibor staff before the Hagen District Court, which ended on 20.12.1966 with a judgment according to which five of the defendants were acquitted, four were sentenced to prison terms between 3 and 8 years and Karl August Wilhelm Frenzel was given a life sentence for murder? Did trusting and incompetent German public prosecutors and even more trusting and incompetent German judges and jurors fall for wholly fictional horror tales about mass extermination at what had actually been an innocuous delousing camp, and did these dumb fucks sentence four innocent people to prison terms and another innocent man to lifetime imprisonment, without their defense attorneys trying or being able to do anything about such fathomless injustice? Was Frenzel just a loving husband and father who had done his honorable duty during the war and who, on top of what the savage victors had done to his family (his wife "died from complications from being raped by a Soviet soldier", according to denierbud) was framed for crimes he did not commit and torn away from his poor children for the rest of his life? The best way to assess the merit of Bud’s claims and insinuations is to look at what is stated in the Hagen District Court’s judgment at the above-mentioned trial about how the court reached its findings of fact regarding mass murder at Sobibor extermination camp and Karl Frenzel’s participation therein. I have obtained the text of this judgment (LG Hagen vom 20.12.1966, 11 Ks 1/64) via the University of Amsterdam’s Justiz und NS-Verbrechen website. Unfortunately I am not allowed to transcribe the copy I received on the internet, as this would be in violation of the editor’s copyright. 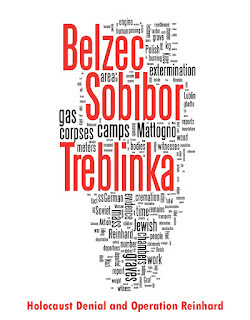 However, I shall in the following provide translations of such parts of the judgment that I consider important to the understanding of how the court approached its task of finding the relevant facts about Sobibor extermination camp and the criminal deeds of Karl Frenzel. • The secrecy undertaking of AR participants that is also transcribed and translated here. 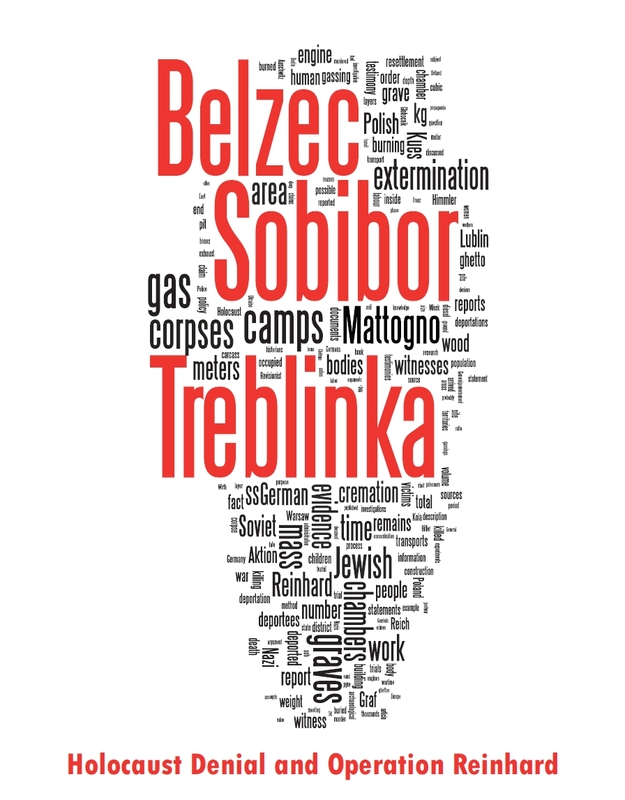 Under the strictest standards to be applied in favor of the defendants it was established that on hand of documentary material and witness depositions from the main proceedings the death of at least 150,000 Jewish people in Sobibor is known. From the outer cell doors of the gas chamber building a light railway led to huge pits for taking in the corpses, which were gradually dug in the camp’s first extermination phase of about half a year, each about 50-60 meters long, 10-15 meters wide and about 5-7 meters deep, the side walls being sloped due to the sandy ground. These findings, based on eyewitness descriptions, are roughly matched by the results of recent archaeological investigations mentioned in this article in what concerns the depth of the graves, which Prof. Kola’s team established as being ca. 4.6 meters. The largest of the seven mass graves uncovered by Kola is a little longer (ca. 64 m) and somewhat wider (ca. 22.9 m) than the maximum length and width assumed by the Hagen court for all graves, whereas the other six graves have the same width of ca. 22.9 meters but are only 18.3 meters long. These and the following findings of fact in this judgment are based on the defense of the ten defendants remaining in this part of the procedure during the main proceedings, on the statements of the defendant Fuc., which he made in the joint main proceedings until the separation of his procedure, on the statements before the jury court of the former co-defendant Bol., whose life ended by suicide during the main proceedings, on the depositions of the witnesses interrogated during the main proceedings, insofar as they did not remain un-sworn according to article 61 no. 3 of the Criminal Procedure Code, on the read-out depositions of the witnesses interrogated outside the main proceedings, on the read-out documents and writs, (insofar as the originals were not read out, the accuracy of typescripts, photocopies and translations was assured through expertise or official certification, or it was of common knowledge and not disputed by any of the trial’s participants), on the inspection of the objects individually listed in the protocol and on the expert’s opinions provided in the main proceedings. In the very critical assessment of the witness testimonies the following, as shall be pointed out here, had to be especially observed: in taking evidence and assessing the witness testimonies considerable difficulties resulted especially from the fact that the events of which the defendants were accused lie back more than 22 years and most witnesses’ capacity for remembering was affected thereby. The recollection of some witnesses may have shifted or become blurred during these years, and for the criminal events proper no neutral observers were available. There were either Jewish witnesses, who had been victims of and endured the terrible sufferings of the time in the camp, or German witnesses, who themselves were in some way involved in killing machinery of "Action Reinhard". Some of the latter have already been convicted, others are still subject to criminal or investigation procedures. While they hardly made use of the right to refuse testimony to which they sometimes were entitled, many of them showed the effort to reluctantly report only the necessary minimum about occurrences that incriminated them as well. Furthermore they obviously suppressed recollections unpleasant to them from their memory. It is also quite possible that the witnesses’ reservation – like that of the defendants in the main proceedings regarding the incrimination of co-defendants – was due to their fearing that the defendants on their part might incriminate them with unpleasant and culpable things if they "opened up". At concerns the Jewish witnesses, it must be noted that the unimaginable suffering that was inflicted on them in the camp, the constant mortal fear and the all-dominating urge to survive made it difficult for them in some cases to correctly record at all the camp staff’s deeds. Almost all Jewish witnesses lost relatives in the Sobibor camp and only escaped death by chance themselves. After the camp revolt and escape, many of them vegetated for another eight months under most unworthy conditions in sometimes harrowing hideouts. Their goal and ambition was primarily to survive, and only secondarily if at all to accurately remember the experiences in the camp. Furthermore it is difficult anyway to accurately remember details out of a multitude of painful and horrible events over almost a quarter of a century. Furthermore most of the witnesses living in Israel and those witnesses who temporarily lived in Israel at the time meet there occasionally (for instance on the anniversary of the revolt, 14 October) and exchange memories. Thus it is possible that they later mix up what they experienced themselves with what they heard. In the case of some Jewish witnesses it also had to be taken into account that due to their close personal involvement with the criminal events there could not be excluded the perhaps unconscious temptation to emotionally hold all members of the camp staff generally responsible "as murderers" for the suffering that had been inflicted on them, without being able to differentiate according to the measure of individual participation and guilt. Finally it had to be taken into account that many of the Jewish witnesses provided affidavits in compensation procedures of their own or of others, and that thereby some witnesses may in some cases have committed to false claims in the correction of which they had no interest. The jury court took all these circumstances into account in assessing the evidence and therefore saw itself forced to an especially careful evaluation of the evidence material. The above shows how far away this highly critical jury court was from the gullible body of fools that denierbud apparently wants his readers to believe in, and how unlikely it is, given the court’s approach to the evidence, that any defendant could have been successfully framed by false witnesses. In the following parts of this article we will find not only further evidence of the court’s critical approach, but also mentions of exhaustive cross-examination of the witnesses and of how defense attorneys went out of their way to discredit eyewitnesses incriminating their clients. We will also see that the court’s findings of fact regarding the life and crimes of Karl Frenzel were based not only on the testimonies of numerous eyewitnesses, but also on how Frenzel was described by his fellow defendants and, last but not least, on the personal impression that the court gained of the defendant during the trial. There is no place in universe that the truth will never reach. It will take the time it will take ; no location will protect the Jews from the truth about World War II. The good old "truth" BS, yawn. "Revisionists" are so repetitive and boring. At least this one doesn't try to conceal the fact that he has a beef with "the Jews". He gets points for that.